Tea houses around Wenshu Temple. Looking up at the Leshan Giant Buddha from ground. 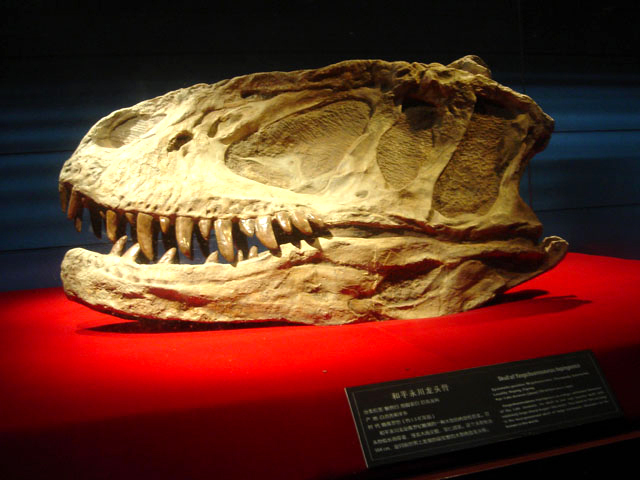 Dinosaur fossil on exhibition in Dazu Dinosaur Museum. 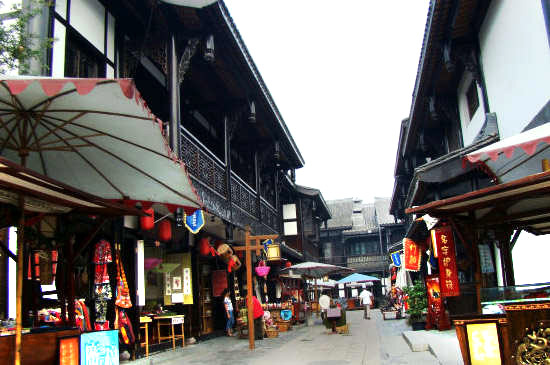 Overview of Ciqikou Old Town. 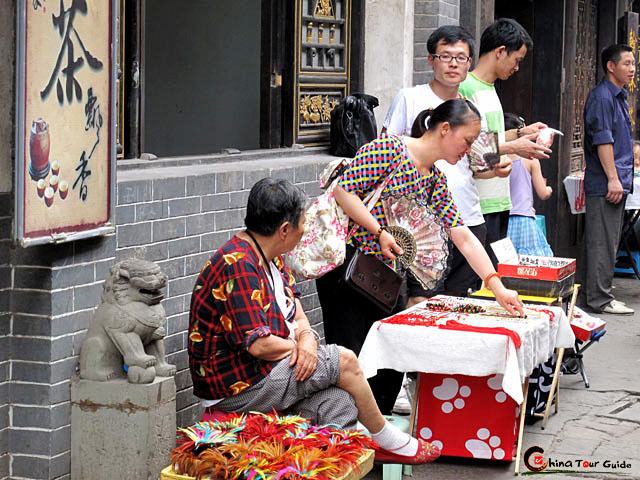 Local handicrafts on street of Ciqikou Old Town. 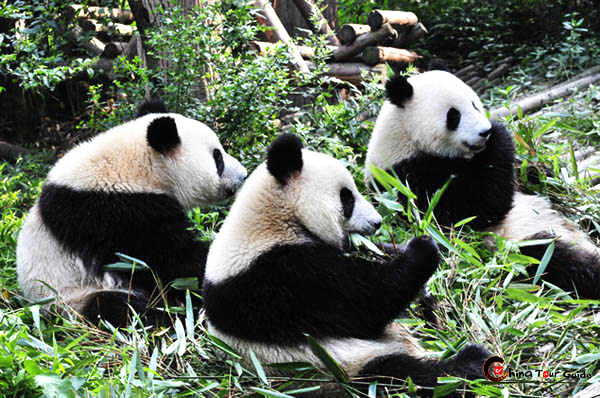 This tour leads you to discover the most famous and popular attractions in Chengdu and Chongqing. 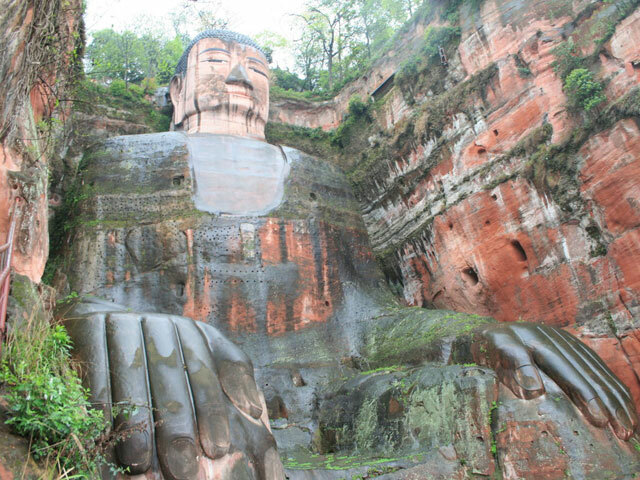 Encounter with Leshan Giant Buddha, Mt. 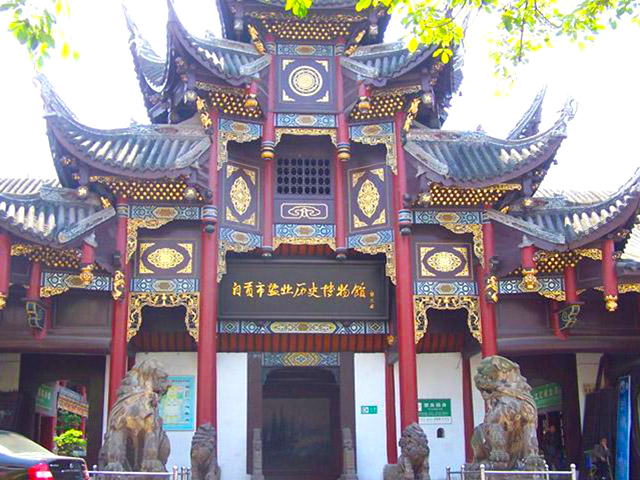 Emei and Dazu Grotttoes for the fantastic sceneris and architectural artistry. 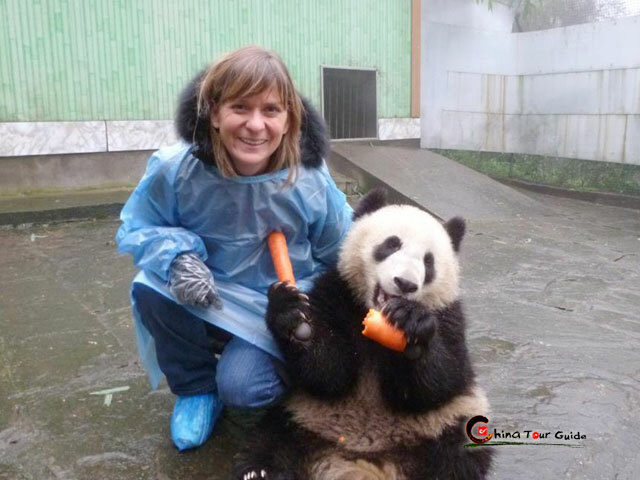 You can also have close touch with lovely giant panda in Panda Base. 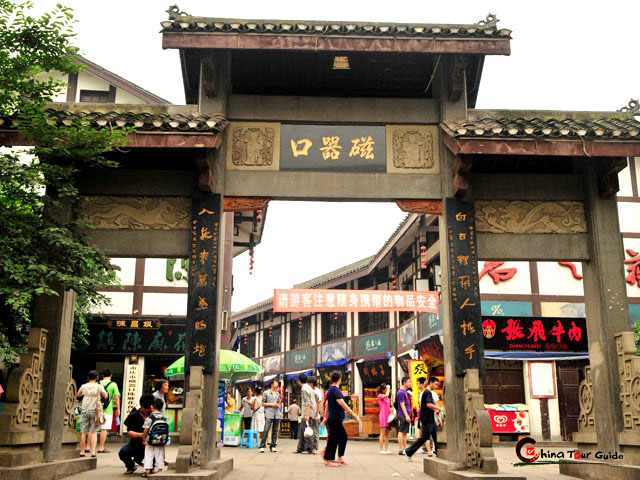 And exploration of the historic sites, like Wenshu Temple, Jinli Old Street and Ciqikou Old Town, will enable you to know more about the two cities' marvelous historic culture. 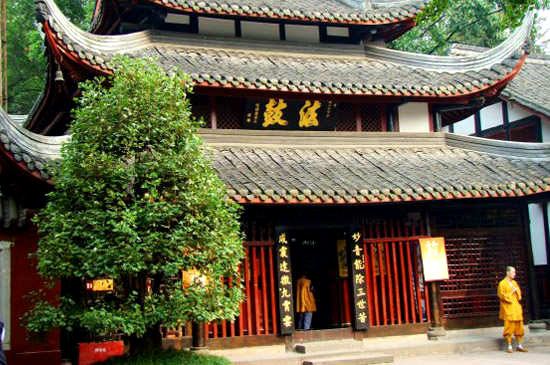 After lunch, you will have a visit of the Wenshu Temple where you can spend some time sitting in its tea house enjoying a cup of traditional Chinese tea and absorb the special atmosphere of Chengdu. 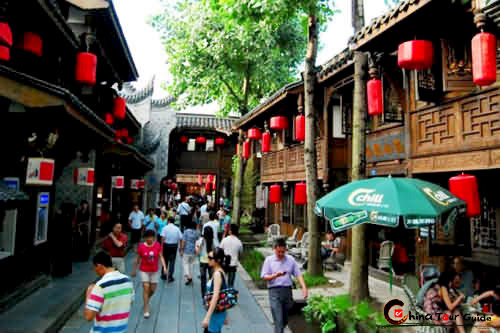 Then you will feel relax to explore Jinli Old Street for local tea house, art crafts and snacks. 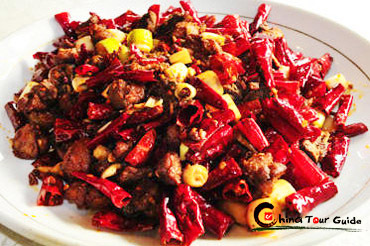 In the traditional atmosphere, you will enjoy the delicious Sichuan food and snacks and learn the local remarkable folk culture. 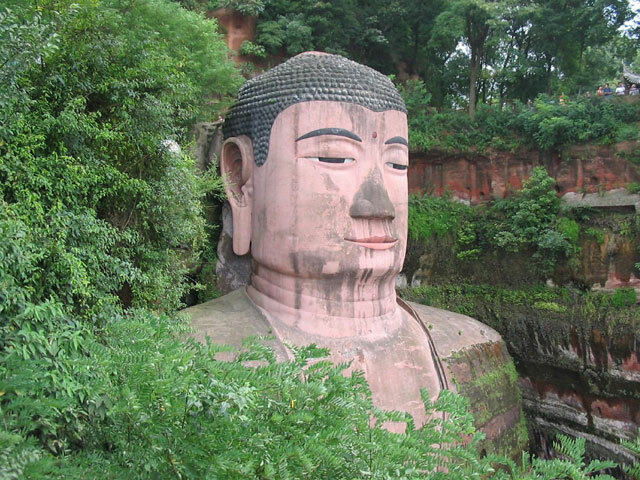 After breakfast we take you to Leshan to visit the spectacular Leshan Giant Buddha, which is the largest Buddha statue in the world with over 233 feet in height and 28 feet in width. Its age is over 900 years. 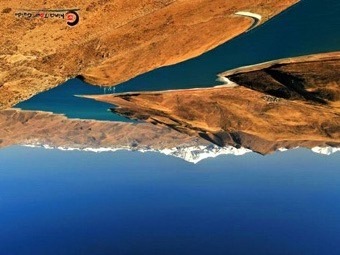 Also it was included by UNESCO on the list of the World Heritage sites. 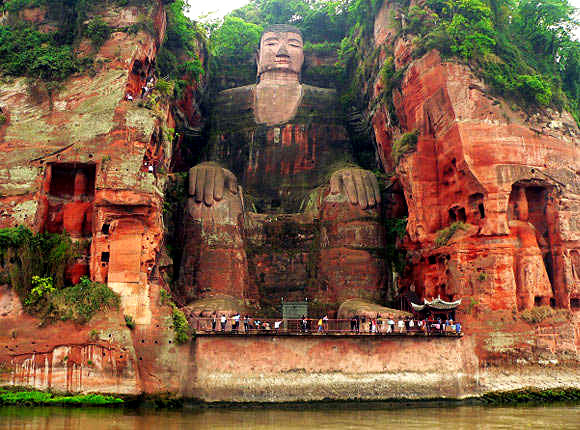 Carving of the giant statue begun in the Tang Dynasty took more than 90 years. 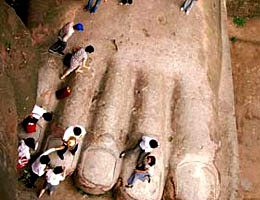 You will catch a tour boat to sightsee the Giant Buddha, and also climb up the mountain to have a close touch with it. 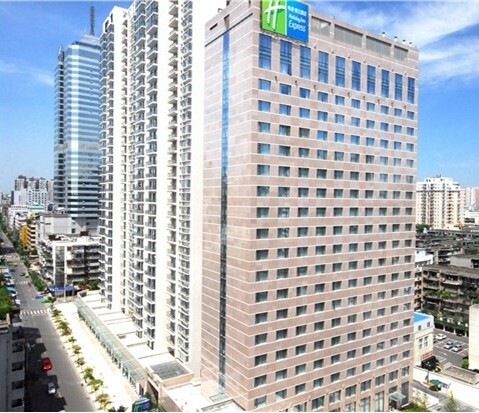 You will be amazed not only by its great size but also by its architectural artistry. Then drive to Zigong. It will take around 2.5 hours when you can have a rest on the bus. 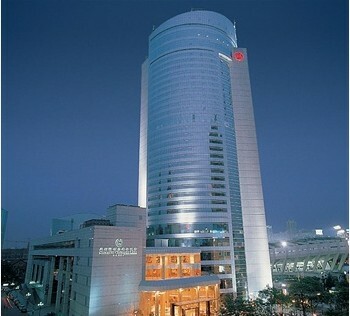 You will have a sound sleep at the hotel in Zigong. In the morning our tour guide and vehicle will pick you up from your hotel to visit the Zigong Salt History Museum. 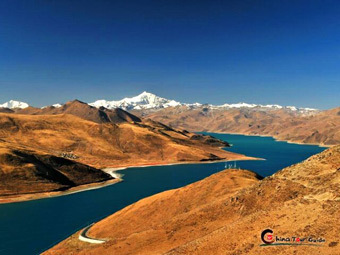 Zigong has a long-standing civilization as well as rich underground resources. The city is also called the "Salt Capital" in the past because of its salt resources and production. Now in this museum you can see how people make salt in traditional way. 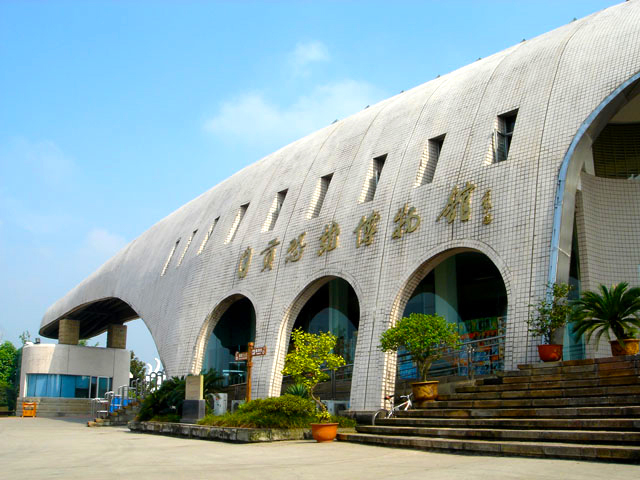 Then you will visit Dinosaur Museum, which is located in the famous site of dinosaur fossils, Da Shanpu. Together with the American National Dinosaur Park and the Canadian Dinosaur Park, it is one of the world's three largest dinosaur museums. You will see the dinosaur fossils on exhibition and vivid dinosaur models, and learn more knowledge about dinosaur's living habit. 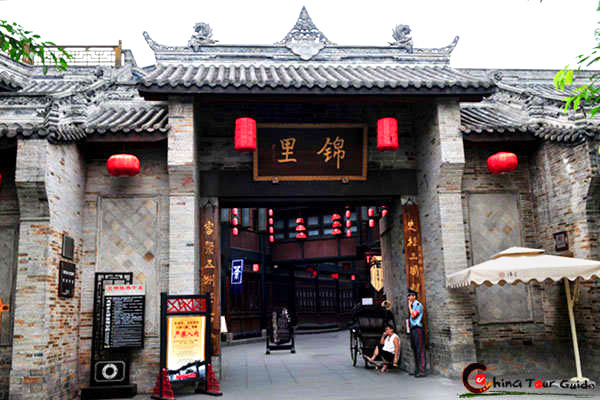 In the afternoon, be transferred to Dazu to visit Dazu Grotttoes, World Heritage sites. 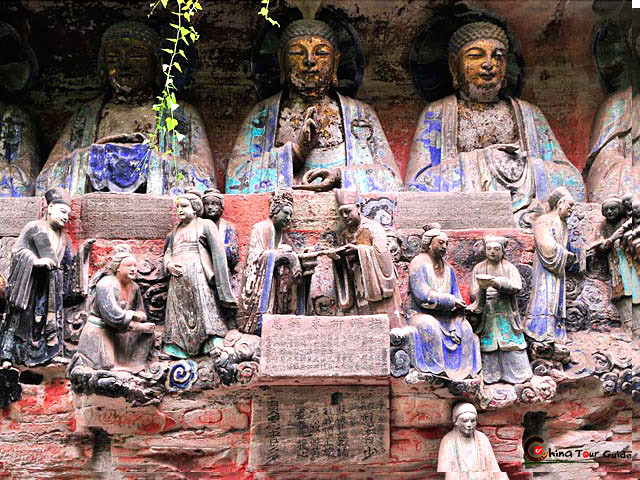 The Dazu Grottoes spread across more than 75 sites in the county, and contain over 50,000 stone sculptures carved from the Tang Dynasty (618-907) to the Qing Dynasty (1644-1911). You will visit the two most famous sites - Beishan (North Hill) and Baodingshan (Baoding Hill). 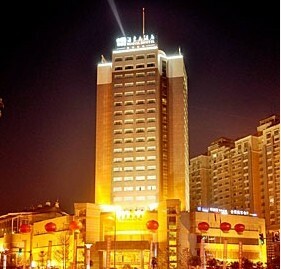 You will spend tonight at the hotel in Dazu. 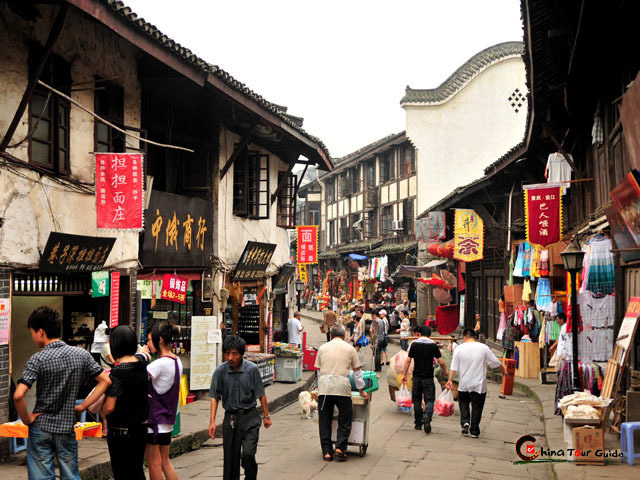 After breakfast, head to Chongqing to visit the charming Ciqikou Old Town. 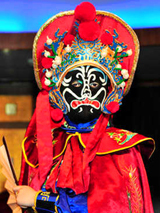 You can experience old Chongqing lifestyle, such as having a cup of tea in an antique tea house, or appreciating a wonderful Sichuan Opera show. Also you will be dazzled by the ancient building on both sides of the street. If you want to touch a more primitive atmosphere, you can climb up along the old foodstep to reach the interior town. 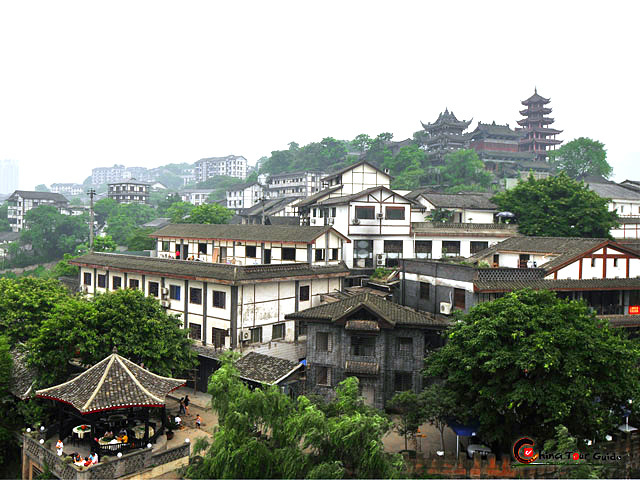 Then you will find an attractive old town with much more Chongqing style. 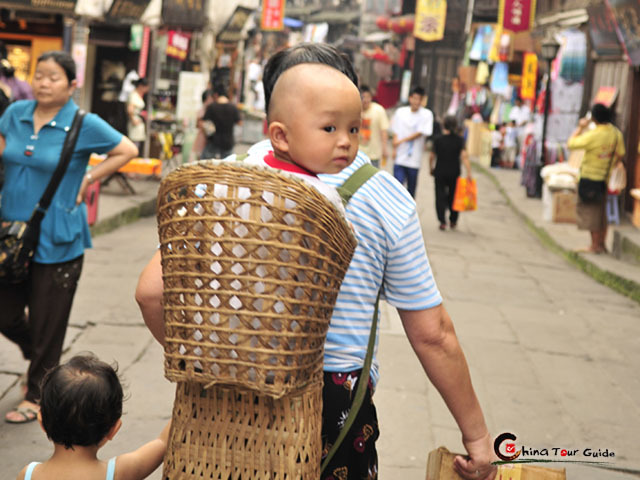 After lunch, our guide will accompany you to Chongqing Airport for your next destination. 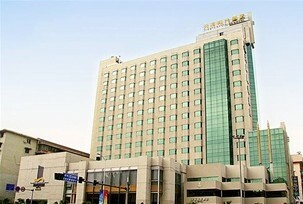 Huidong Hotel Zigong is a 4-star hotel centrally located in Zigong City. It's the most luxurious local hotel. Neighboring the hotel are Salt Industry History Museum, In addition, it's 2.5 km from Zigong Railway Station, 77 km from Yibin International Airport. 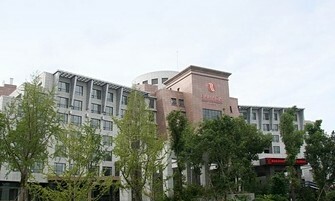 Ramada Plaza West Hotel Chongqing is an international 4-star hotel in downtown Dazu County, Chongqing City. 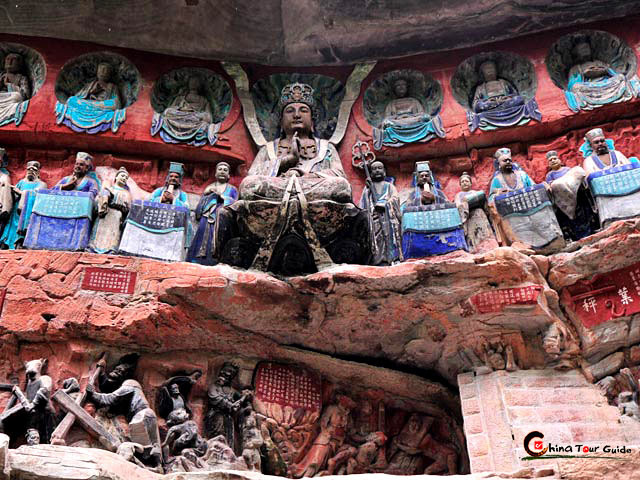 The hotel is conviniently linked to the main rock carving sites of Dazu like Beishan and Baoding rock carvings. 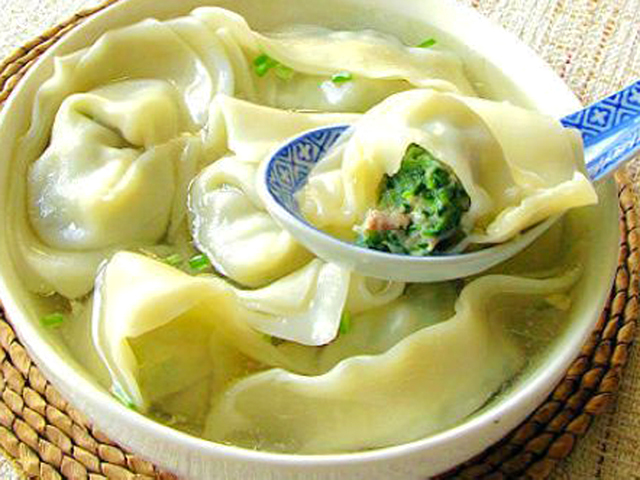 Meals as mentioned in the itinerary include 4 breakfasts provided by the hotel and 4 lunches.